‘Electric Earth’ illustrates the difficulty of a sweeping retrospective by smashing excellent video work up against shallow sculpture. LOS ANGELES — Strains of The Flamingos’ 1959 doo-wop hit single fills the main hall at the Geffen Contemporary: “I don’t know if we’re in a garden or a crowded avenue / I only have eyes for you.” The reverb-soaked recording draws viewers into the heart of Doug Aitken’s exhibition, Electric Earth, where a 360-degree projection wraps you in the voices of a rotating cast of minor celebrities, kaleidoscoping visuals and cityscapes collaged together into an ambiguous and sensual narrative. Since the ’90s, Aitken has shown an aptitude for masterful video installations, which he doesn’t fail to deliver here. But the artist’s forays into monolithic sculpture create shiny but boring interludes from the spells cast by his video work. He, like other stars, has ironically fallen in line with the very forms of consumer capitalism he fought against in his earlier works — even within the same show. The 35-minute centerpiece of Electric Earth, the encompassing “Song 1” (2012), is a feat of contemporary video art and a rich accomplishment for cinema as a whole. The experience of watching it is so captivating that the half hour passes without a moment of distraction as you twirl around and around within the screen that embraces you with a multichannel video. It’s a high-definition, high-fidelity sensory overload in a world where our senses are shocked into submission from a million tiny LEDs every day. The video is layered with subtlety, and the multiple narratives crisscross and interact, creating subtexts and abstractions. Images of spinning reel-to-reel tape decks bleed into turning car wheels. Scenes from a factory floor are echoed in diners and empty parking lots. Everything breaks down into compositions of light, while “I Only Have Eyes for You” is presented in several versions and voices throughout the piece. The varied iterations of the song recall its many interpretations in popular culture, from The Flamingos and Frank Sinatra (1955) to Art Garfunkel (1975), and the various versions of us suggested by the multi-character narrative contained within the video and acted out by different actors singing the same song. Moving on from the main work in the central gallery, some of Aitken’s most successful video works from the ’90s and ’00s are set up in smaller spaces, recreating their original installations as exhibitions in and of themselves. In “These Restless Minds” (1998), Aitken criticized capitalism’s impact on the human and natural world through a multichannel video installation featuring auctioneers rapping empty pitches to a nonexistent audience, punctuated by images of oil wells and gas stations. The 1999 video installation “Electric Earth” brings the viewer into a dystopian urban chaos wherein a young black protagonist anthropomorphizes the city through his body, bringing the lights and energy of electric sounds to life through a jerking, spastic dance. On one of eight projectors, the performer is reclined on a couch musing about transcendence through the body; in another frame, he’s dancing as if in a trance. Elsewhere in the expansive show, the artist poetically alludes to issues of climate change, neoliberalism, and free capitalism. Throughout, he uses multichannel video installations to give the viewer insights into a nonlinear narrative practice. But eventually, the critique becomes cliché. For example, gilded mirror sculptures spelling out words like “more” and “now” seem to lack a deeper meaning beyond the ironic critique of consumerism’s incessant drive for “more, now.” We can give the artist the benefit of the doubt and assume that he is being purposefully ironic, but the forms are too typical and art-fair-ready to stand alongside his nuanced video works. The sculptures are homogeneously blue chip, mirroring (in this case, literally with mirrors) forms by shiny superstars like Anish Kapoor, Damien Hirst, and Jeff Koons. But, hey, we all have to eat. The low point of the show is, not surprisingly, the most monolithic and shiniest object: a giant mirrored black cube, called, appropriately, “Black Mirror” (2011), which the viewer enters to witness another video work reflected “infinitely” (enough already; Yayoi Kusama did it in the ’60s!) in the mirrored surface within. 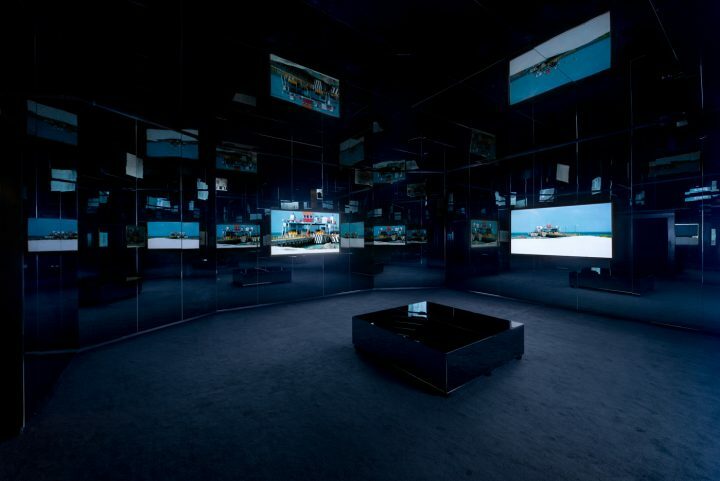 The central video installation, “Song 1,” is actually much more successfully immersive. The video for “Black Mirror” would have been more effective had it been presented on its own, but, as it is, the unlimited reflections distract from the content of the narrative, which should be quite moving. The artist’s decision to present a single video in the space is confusing because no abstraction or decimation of linear time takes place through the reflection of the single narrative. You can imagine the cube being more allusive if the four screens showed four different videos that mixed together and became abstracted in the reflections. It’s hard to pull off a sweeping retrospective that demonstrates the evolution of an artist’s studio practice with a coherent line of inquiry throughout. Electric Earth illustrates the difficulty of such an undertaking by smashing excellent video work up against shallow sculpture. The videos do deserve all the attention they can get, and the exhibition could have been more coherent with some careful editing on the part of the institution. Electric Earth continues at Geffen Contemporary at Museum of Contemporary Art (152 North Central Avenue, Los Angeles) through January 15, 2017.